Stephenie Meyer is publishing a new Twilight book in April but, unfortunately, it’s not Midnight Sun. The new book is called The Twilight Saga: The Official Illustrated Guide, and it’s a full-color, illustrated encyclopedia to the world of Twilight. 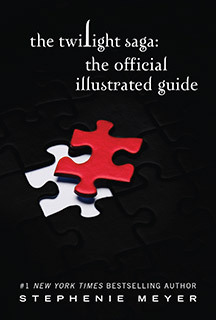 Little, Brown Books for Young Readers will release the guide on April 12, 2011 in hardcover and ebook. The Guide also includes character profiles, outtakes, a conversation with Meyer, genealogical charts, maps, extensive cross-references, and much more. Originally announced as “The Official Guide,” The Twilight Saga: The Official Illustrated Guide includes illustrations from several artists, including Young Kim, the illustrator behind the #1 New York Times bestselling Twilight: The Graphic Novel, Volume 1. The Twilight Saga: The Official Illustrated Guide will retail for $24.99 (although it’s currently $14.29 on Amazon).